36 Free Text to Speech Programs: – Text to Speech programs allows you to listen to the text by reading it aloud rather than you reading it the traditional way. These programs are specifically useful for your eLearning courses, for those who have difficulty reading or writing, helps promotes conversational skills, develops knowledge and while you are on a long drive you can carry the eBooks in form of audiobooks for you to be able to rather listen to them. Isn’t that an interesting concept? Although there are tools available online , but we have compiled software and tools which you can use even in offline mode in your PC. Well, we like it too and hence, today we have compiled a comprehensive list of the Free Text to Speech Programs that you can download on your Windows platform easily. The listed Text to Speech programs read text effortlessly that you write or paste, save text in the different formats like, WMA, WAV, OGG, MP3 and more, easily reads word and PDF files, web pages, emails or clipboard stuff, voices the text in different tones, helps tweak the speech rate, adjust volume and much more. Therefore, whether you are looking to create an audiobook or starting an eLearning course choose from one of these free text to speech programs that will meet your needs. A free an open source TTS program with an interface that’s simple and easy to navigate, eSpeak is a neat and compact program that can read your TXT and XML documents aloud in many different voices. While t allows you to input or copy text to its window, you can also convert text to WAV files that can be opened and played. Moreover, you can adjust the speech speed and volume effortlessly. NaturalReader is one of the best free text to speech software in the category and there’s no doubt about it. It not only reads the text aloud to you, but you can also change voices using Microsoft Voices, turns web pages, emails, PDF and MS word documents into phonic words, and also tweak the reading rate. Select your text, press any hotkey and the program read the text aloud to you, and that’s as easy as that. If you already have SAPI5 text to speech voice installed on your computer, Read4Me TTS Clipboard Reader reads the text in the clipboard aloud by hitting a hotkey. You can set several hotkeys targeted for multiple voices, adjusting the rate of speech, volume and for multiple languages. It also converts text documents to MP3 so that you can carry it anywhere as an audio file. A multi-language TTS technology, Ivona boasts a team that constantly innovates, researches and produces high-quality output with top-class voice quality and accuracy. You can rest assured of maximum performance on all devices with improved voices for your platform, get cloud assistance for recording and receive technical support at every stage of the execution process. 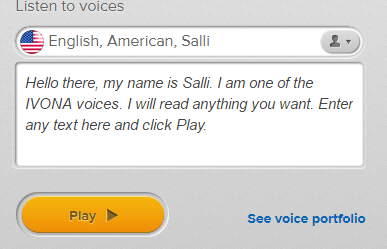 Ultra Hal TTS Reader reads content aloud using the several high-quality voices that are available in the free version. It can also read other stuff aloud such as instant messages, Windows prompts, emails, clipboard text and even web pages. Additionally, if you want to carry an audio version of your document in a CD or make an MP3 file, Ultra Hal TTS Reader easily converts it into WAV format. 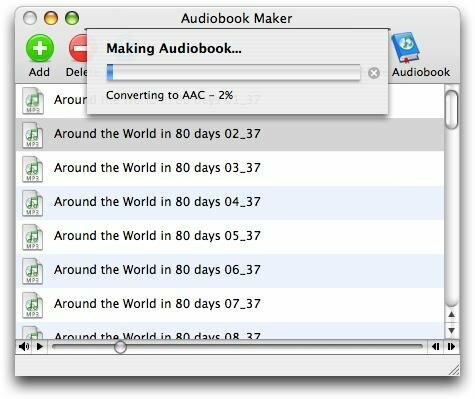 If you are looking for a top-class freeware, there can be possibly very few competitors to AudioBookMaker that reads your text in a human voice. It offers features like speech parameters that can be adjusted like, volume, speed, and octave, an interface in multiple languages and the ability to recall each document settings like, colors or voice criterions amid the reading process. The free version of the Zabaware Text to Speech Reader uses speech synthesizer to read documents and other stuff aloud in generic voices. It can also read web pages, clipboard content, Windows prompts and emails. Useful for especially for those with visual disabilities, reading and concentration issues, this program helps read a lot of stuff quickly with speed reading. With over 20 computerized voices, Speakonia is a freeware in the category of text-to-speech program that reads text aloud to you. Swiftly adjust the reading pitch and rate, type text to speech, open any text document for reading, save content in WAV format to be able to listen to the files on the go with Speakonia effortlessly. Register the program online for free and get access to all its nice features. You can use iSpeech under its free trial version that allows you to convert text to high-quality speech audio. The audio generated can be in different formats like, wma, flac, mp3, mp4 and wav. That’s not all as you also get access to several of its other online apps and services that include the iSpeech Translator. It helps translate the audible text in 7 languages and reads the translated text in 18 languages. Listen to any of your TXT or HTML files, or any typed text as Text to Wavs reads it aloud for you. Not just that, it can convert .txt or .html files to WAV and lets you choose from many different voices. Additionally, you can also adjust the rate of speech, volume or the pitch of the robotic voice by adjusting the slider in the direction you want. Yes, you can also adjust the text font. Text to WAVs is a portable program that does not need to be installed. If you are looking for a free text to speech program that’s also portable, Computer Talker is one of them and that works on the System.Speech.Synthesis process to speak. While it reads any text that you input on its interface, it reads only what you type and nothing else. Since it’s a portable program, you can run it through any media storage device anywhere. Try this unique app, Acapela Group Virtual Speaker for free that reads text in 30 languages. It integrates easily and offers voices in multiple test pitches that make it one of the best in its category and a TTS program perfectly suited for eLearning projects. Additionally, the audio files are extremely convenient to be picked up from any of the writing tool that you are using. In addition to reading any text file or anything that you typed, aloud SpeakOut also speaks out the clipboard contents quite easily. The software helps you to open any text document easily and then reads it out to you. Yes, it also has the additional functions to pause the reading or you can even stop when completed. SpeakOut is a freeware and comes with a simple user interface. Kyrathasoft Text to Speech is a compact and complete software that can convert your text documents into audible WAV files (words spoken out) using the default SAPI and Microsoft Voice of your PC. The program is absolutely free of cost and works fantastically, with no damaged functionalities and no trial period. Well, TypeIt ReadIt is not just about reading the text that you type, but it also reads any text documents aloud and converts text to WAV file format effortlessly. While you can choose from many of the voices available, you also have access to several settings options to change. It features a user-friendly interface that super easy to use. 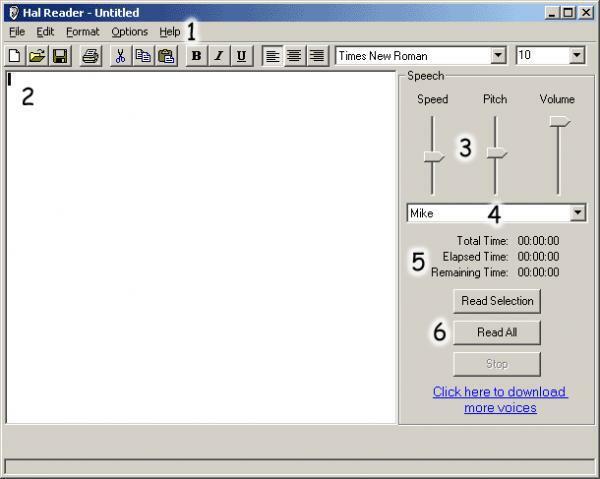 Among the freeware category, FeyRecorder is undoubtedly a unique TTS program that reads out text files aloud in natural voices. You can even convert other sound files into audible files like, online radio, DVDs, CDs and video games using this software. From MP3, AIFF, WMA, AU, OGG to VOX, it supports various formats. The best part is that you can carry the audio files in a portable media storage device to listen to them on the go. Using yRead3 you can upload text files (TXT) in a window that can be resized so that it can read the text aloud in a human voice. yRead3 is the latest version of the parent program that is compatible with Windows XP, Vista, 7 and needs at least .NET Framework 3.0 to function. yRead2 is also available to be downloaded that can t=run on the same PC. Using this software, you can listen to your own write-ups, eBooks or any other stuff written in TXT format. You type any text on its window or paste any text file; RoboBlather reads it out loud to you for free and efficiently. Check the option that says “Render to File” and save text as an audio file in WAV format. What we like is its five-speed settings where you can increase the voice speed from Extra Slow to Extra Fast and vice a versa. The program comes with a straightforward interface that is easy to navigate. TextAloud3 reads text in over 29 languages and features a long list of voices in different dictions that belong to leading voice creators like, Acapela Group, Nuance Vocalizer, AT&T Natural Voices and Ivona. What more, as it also features a pronunciation editor which can be especially useful for translating your eLearning courses. Try the software under the free trial version and save time. TexttoWAV can read out any of the text that you type on the window or paste and converts text documents to WAV, WMA or MP3 files with the help of text to speech engines like, SAPI4 and SAP5. You can choose from its several predefined voices and adjust the rate of speech, intonation and the volume by conveniently moving the sliders. The freeware features a handy interface that’s easy to toggle through. Another freeware in the category, ulisten reads out your text files, PDF files, we pages, word files and more effortlessly. This software is compatible with different formats like, PDF, DOC, HTML, CHM and TXT. Among its many other features are its ability to read even he RSS feeds aloud, and saving the audio in MP3 file format. It’s an easy to use program that lets you set any point to start the reading process. Another free text to speech software with the same name, but with a space Speak Out is an extremely straightforward program that efficiently reads the text that you type in its interface. It will also read any text pasted on its interface. Not just that, you can learn to pronounce words with this software and even listen to the sound of fresh words. It comes with the user-friendly interface. Whether you type in the text using your keyboard or paste a text file, TalkingBook will read all that and even saves the reading sounds as WAV audio file for the blind in alliance with Richard Russel Recorder. If you feel they are a tad larger for the memory, you can convert them in MP3 format for compressed files. TalkingBook features a simple interface that’s easy to use. Panopreter Basic is a freeware that reads files in TXT, DOC, MHT, HTML and RTF formats aloud. You can also type in text or paste a text file form the clipboard into its window for the TTS software to read it aloud, using its Input and Speak tab. In addition, while you can save the spoken files in MP3 and WAV format, you can also adjust the rate of speech of the voice by moving the slider. Read the Words is a pretty interesting text to speech tool that does a lot beyond just reading the text aloud. The free version includes 3 languages, ability to prepare sound files up to 30seconds in length and offers different types of voice characters. For an unlimited length of audio files, you need to upgrade to the gold version. As the name suggests, Text2Speech is a text to speech software that can read TXT and RTF files in no time. It has different settings that allow you to adjust the volume and rate of speech easily and lets you choose from many different voices. If you want to create an audio file, you can easily convert them to MP3or WAV file formats. Featuring a simple interface, Text2Speech is fairly easy to use. 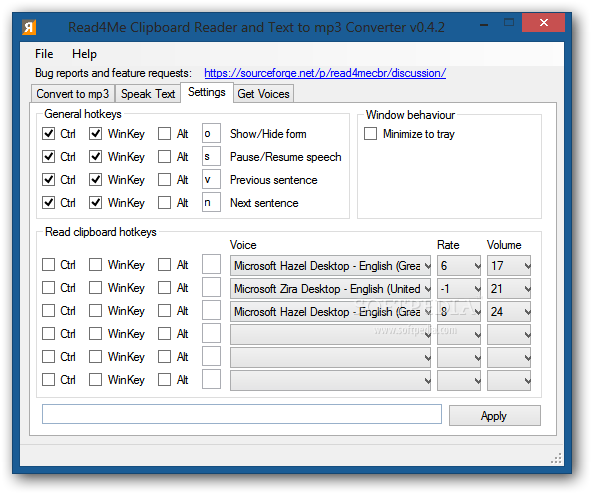 A freeware, DeskBot offers a multi-featured clipboard reader, time announcer and a text reader for your Windows OS. Whenever you want the software to read the text aloud, simply select text from your desired location and press Ctrl + C. Right-click on the DeskBot symbol and explore more commands and options. As and when the clipboard content changes, the software reads it aloud. Okay, now PowerTalk is one of the unique text to speech programs that read your Microsoft PowerPoint presentations aloud. You can simply open the desired PowerPoint presentation and the program starts reading the text as it appears on the report along with the concealed text attached to the pics. The speech is powered by synthetic voices that are found in Windows XP, Vista and Windows 7 versions. Type text using the keyboard, paste your desired text data or load a chosen web page in its window, SayITNow reads out the content easily. That’s not all, as you can also modify the speed of the speech, effortlessly, and even save the text files as WAV audio format. Additionally, you can also choose from the various voices in the program. SayItNow can also create multiple files on a single file each line basis, helping you to create word list or phrases in a matter of minutes. If you have copied or cut text to the clipboard, ClipSpeak reads that aloud easily. It’s a compact and portable text to speech application that converts to MP3file format for you to be able to listen to the audio file on your computers, portable media storage devices, CDs and smartphones. Give Stop Reading any English text you want to listen to, and the program reads it out to you loud for free. This user-friendly application makes use of speech synthesis to convert English text to a voice that sounds like human. 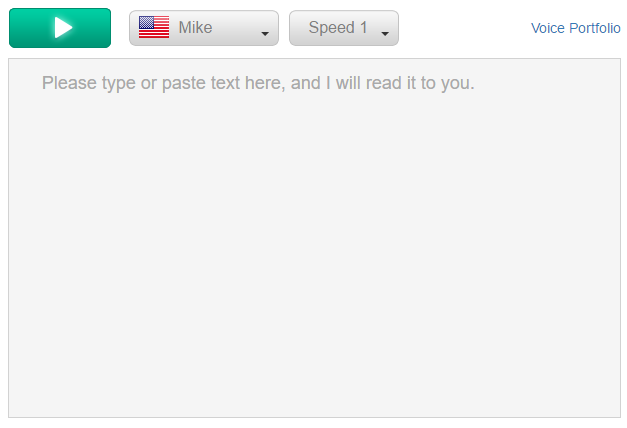 Type or paste text taken from clipboard to its interface, press the Speak button, and the tool reads it aloud for you. you can also pause or resume the reading process. DSpeech is another free TTS tool that features a unique functionality called Automatic Speech Recognition (ASR). While it can read the text aloud for you, the program can also save the text in audio files in different formats like, MP3, OGG, WAV and AAC. It’s a portable software that does not need to be installed and offers you the facility to change the voices too. Balabolka reads any clipboard content effortlessly using the text to speech process from several different files formats such as PDF, HTML, RTF, DOC and much more. 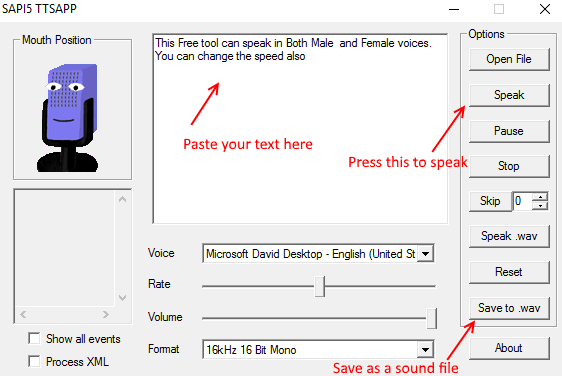 It uses different editions of Microsoft Speech API to read the text and also allows you to configure the voice options that include its speed and intonation. Not just that, but you can also make audio files from text in MP3, WAV, AAC and many other file formats. Moreover, the tool also lets you save the text with subtitles in the metadata of the sound file or in the LRC format. If you have a written material, ReadTheWords.com can read it for you in no time and in a clear sounding audio file. You can either just copy any text or attach an office document by Microsoft, an HTML document, a PDF file or TXT into the window and it just reads it aloud to you. Not just that, the program also reads any RSS feed URL or a web address and it reads the text to you. Save the text file that the tool reads, download it on your smartphone, to your computer, for the portable media device or embed t on your site, ReadTheWords.com lets you do much more than just a TTS tool. ReadClip is a lot more than just a TTS reader, as it also features a text editor that can read any document as well as runs a spell check, lets you be in control of any image clips or text copied to the clipboard, and sets up MP3 files. It’s up to you whether you want to keep ReadClip hidden, or you can also choose to show the text it reads in the clipboard and accentuate the words as it reads them aloud. Type the text, load a text file or simply copy and paste text into the software, ReadClip does a lot more for you in the free version. With Read Aloud you can either add a web address to be browsed by the software and then reads the text aloud, or paste text into the panel under the “Textpad” tab to be read aloud. Either way the program meets your needs quite efficiently. Not just that, as it can also read content aloud to you that are in the clipboard watcher.